Most swirl breads are flavoured with cinnamon, but I'd decided against it because it isn't too popular a flavour in our house at breakfast. Oranges on the other hand - we can't seem to get enough of. It's blended into our morning smoothies, snacked on, even the breakfast jam is marmalade (albeit rotating with strawberry jam). It didn't take a genius to work out that the swirl bread was going to be an orange swirl bread. 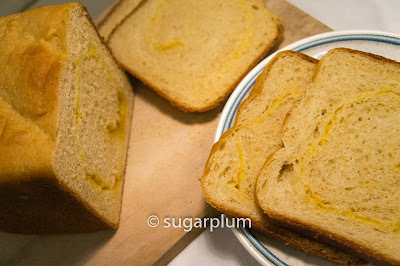 Having had previous successes with Darla of Bakingdom's bread recipes, I decided to work on this using her vanilla swirl bread recipe and adapted it for the orange zest. 1. Combine the zest and sugar and gently rub the sugar/zest mixture to release the aromatic oils. Keep aside until needed. 1. 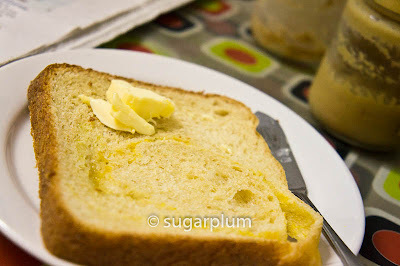 Combine the butter and the hot water and stir until butter is completely melted. 2. Stir in the milk into the butter/water mix and leave to cool before whisking in the eggs. Be careful as you don't want to have scrambled eggs! 3. 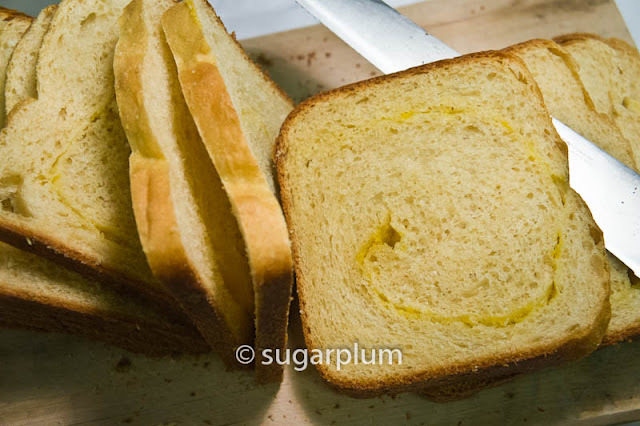 If using a bread machine to knead, place the liquid mix in first before adding the flour, sugar, salt and yeast. Knead in dough cycle until the dough is smooth and elastic. If it is too sticky, just keep adding 1 tbsp of flour and continue kneading until it becomes less sticky. 4. If kneading by hand, knead until dough is smooth and elastic. 5. Cover the dough with a damp tea towel or cling wrap to prevent dehydration. Allow to ferment and rise until doubled ( approx 1 hour). 6. Once the dough is doubled in size, gently punch it down and rest it for 10 minutes before shaping. 7. On a lightly floured surface, roll the dough out into a rectangle 12" x 18". 8. Lightly brush milk over the dough and sprinkle/dab/pat the orange zest sugar over the dough. 9. Roll the dough up tightly into a loaf shape (like a swiss roll), and place it seam-side down into a loaf tin. 10. Cover and allow to rise until doubled in size (approx 1 hour). 11. Bake at 350F (180C) for about 40 - 50 minutes, or until internal temperature reaches 190F inside. 12. Cool on a wire rack before slicing and serving. Do wash the oranges carefully before zesting as there may be waxed. Used unwaxed oranges if possible. 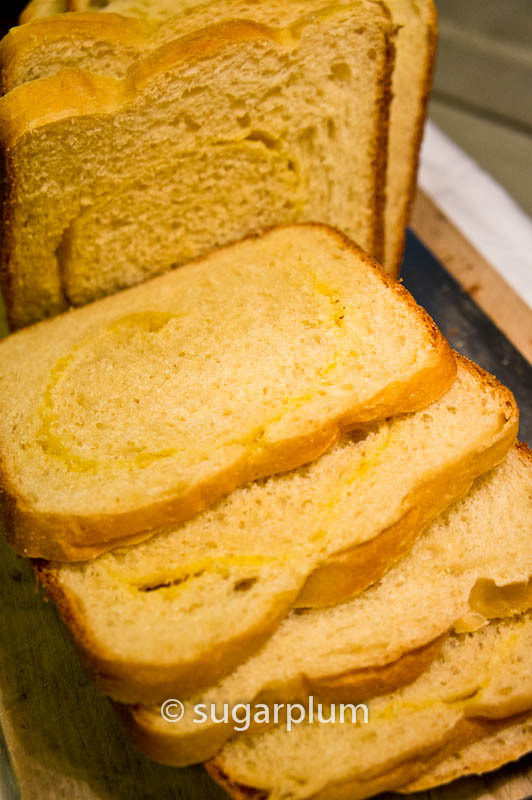 For more fibre, substitute 1 cup of plain bread flour with 1 cup whole meal bread flour. The dough can be fermented overnight. Just cover the dough and leave it overnight in the fridge. If you are using wholemeal flour, overnight ferment produces a more flavourful bread.